stadium i didn't think i would able to photomatch it. I did find this photo however and think i see a match on the Mets skyline patch. 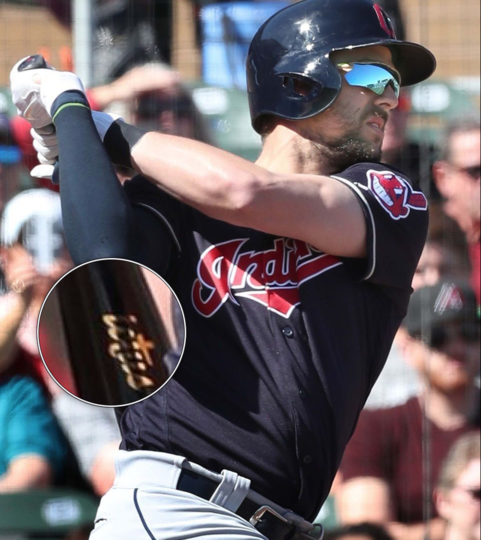 Victus Axe Bat used by Lonnie Chisenhall during spring training earlier this year. Photo-matched to a single that he hit off of Taijuan Walker on March 27th at Chase Field. 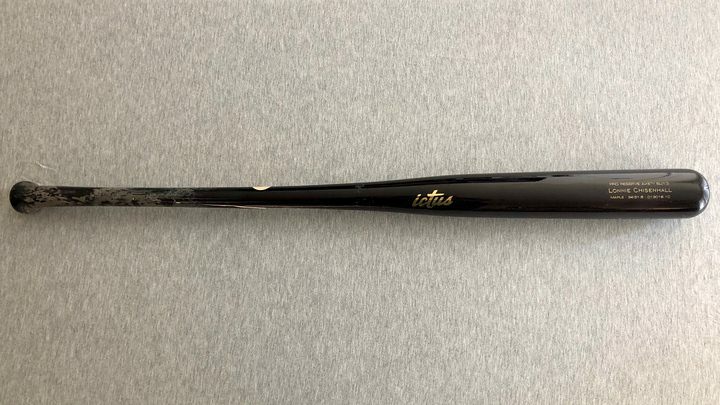 Bat was cracked at a later date. Just an FYI for photo-matching because I don't think this has been discussed on GUU. You can now go to the majority of photos on Getty Images, click on the thumbnail preview, and there is an option to "Buy the Print". You are then forwarded to photos.com and can purchase a print from anywhere between $80-$100 pending on the size and standard 20-40% off coupon codes you can easily find online. I purchased a few and they are high quality, hi resolution prints and are much better than the printed on standard zoomed in paper photo-match prints offered by some of these companies. they sell the exact same pictures for $1.99 (for a 4x4) on up to $132.99 (for a 24x36) when they run their 70% off sales or starting around $25.00 regular price for 8x10. They also have different material options from plain old prints to acrylic prints. I have found that not all the pictures on Getty are on this site but the site does pull from most of Getty's pictures. They run the sales quite often, I get an email every month or so for the sales. In fact right now for a limited time they are running their 70% off sale. An 8x10 print is $6.99 with the sale. 1. Yet another reason this place has gone downhill. Not everyone collects baseball. Ever try to get NFL photomatches? That's just 1 example. NFL photo store also has pictures directly from Getty images. Right now they are 50% for a limited time. Looks like prices start out at $1.99 for a 4x4 and go up to $177.99 for a 24x36 with the price of an 8x10 at $8.99. Also available in different print formats from regular prints to Acrylic prints. Do you also get this upset if there is information about Soccer? or Basketball? or Hockey? or Boxing? or NASCAR? I do believe that all sports are welcome here as well as all helpful advice. Maybe next time you could specify that your post is about the NFL and all others need not comment or offer alternative advice if you are that sensitive or Maybe you could make an NFL only photomatched thread so the rest of us will not offend you. Alex Ovechkin's 2009-10 Red Set 2 Washington Capitals jersey. I'm really happy to finally get not only one of Ovi's Caps jerseys, but also one with some pretty good stats and number of games worn. It is also photo matched several times over. Ovi wore this jersey for 15 games, and had 10 goals, 18 assists, and 28 points. He scored a hat trick against Pittsburgh (2/7/10) and at least one point in every game that he wore this jersey. Also notable for this jersey/season - 50 goal/100 point season, 1st Team All-Star, Ted Lindsay Award, and the Caps first President's Trophy. Ovechkin 2017-18 white set 1 w/ 100th ann. patch game worn jersey from the Stanley Cup Championship season! He scored 2 hat tricks in this one, set the Capitals Franchise hat trick record (20) and set the NHL all time overtime game winning goal record in this jersey. Ovechkin 2016-17 game worn helmet worn for his 1000th point vs Pittsburg. Last edited by Hattrick8; 09-25-2018 at 11:36 AM. 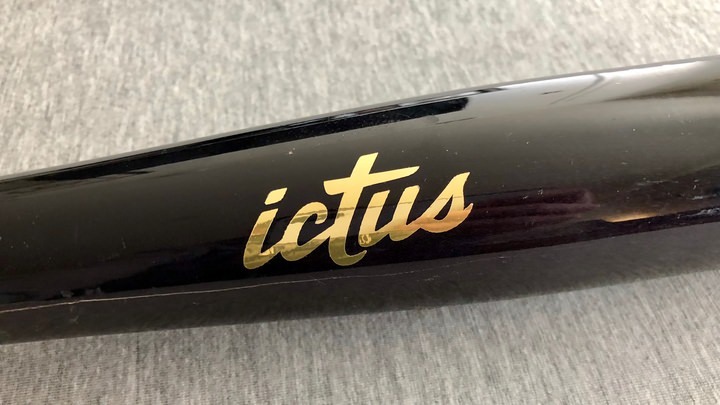 Yadier Molina Bats. Each bats photomatched to Home Runs. Im looking to purchase a Marino game jersey and have been burned in the past. I found this but I cant confirm its legit. I feel its missing the JR patch and cut under sleeve, although it does appear widened. LOA aside, it says sold on Lelands. I found that listing on their website but not any better description and fewer pics. Any thoughts on this one if ti is real?